FRAMINGHAM, Mass., November 28, 2016 –The first Worldwide Semiannual Small and Medium Business Spending Guide from International Data Corporation (IDC) forecasts small and medium businesses (SMBs – businesses with less than 1,000 employees) will spend $564 billion on IT hardware, software, and services, including business services, in 2016. This amount is expected to increase at a compound annual growth rate (CAGR) of 4.2%, reaching $668 billion in 2020. The new spending guide expands on IDC's previous small and medium business forecasts by offering greater detail on spending by technology, company size, and geography. "The Third Platform has disrupted traditional IT markets and how large organizations deliver IT services. For SMBs, the result has been largely positive: a stronger ability to compete with larger firms, more easily enter new markets, more quickly develop new products, and drive higher levels of employee productivity. Over the next three years, we expect IT solutions to drive business outcomes, and in turn further close the competitive gap between SMBs and enterprises," said Chris Chute, vice president, Customer Insights and Analysis. SMBs will invest similar amounts in hardware, software and IT services throughout the 2015-2020 forecast with these three categories representing more than 85% of the worldwide total. While hardware purchases currently represent the largest share of this spending, it will also experience the slowest growth. 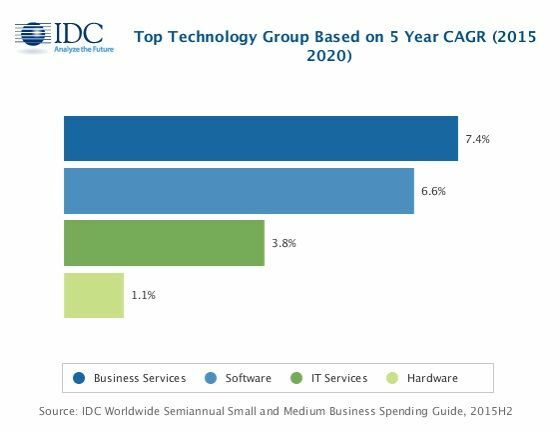 Software, which is expected to grow faster than the overall market, will overtake both hardware and services to become the largest spending category by 2020. Business services will see the fastest growth of the four categories. More than half of all SMB software purchases in 2016 will go to applications, led by enterprise resource management (ERM), customer relationship management (CRM), and content applications, with the remainder evenly divided between application development & deployment and system infrastructure software. Hardware spending will be led by purchases of telecommunications equipment, personal computers, and peripherals, which will make up nearly three quarters of all hardware purchases in 2016. More than 40% of SMB services spending will go to outsourcing, which includes applications management, hosted applications and infrastructure management, and IS outsourcing as well as business process outsourcing. The remainder will be used to purchase project-oriented services and support & training services. On a geographic basis, the United States represents the largest market with SMB IT spending expected to total $168.7 billion in 2016. The U.S. will maintain a total share of roughly 30% throughout the forecast period. Western Europe and Asia/Pacific (excluding Japan) are the second and third largest regions for SMB IT spending, with Asia/Pacific growing faster than the overall market. The regions with the fastest grow over the five-year forecast are Latin America, the Middle East and Africa, and the United States. "Western European SMBs show strong interest in adopting new disruptive technologies. Third Platform technologies are now imperative, as they are the building base for the adoption of Innovation Accelerators. In Western Europe, over 99% of companies are SMBs and they spent $154.3 billion in 2016, so they represent a relatively big market that is now transitioning to digital," said Angela Vacca, research manager, Customer Insights and Analysis, IDC. "European SMBs have been so far deeply rooted in their local market while today they have the opportunity to become more visible across borders as the Internet of Things and robotics combined with cognitive systems and 3D printing are reshaping the IT landscape. The adoption of all these technologies is creating new opportunities and, as a result, demand for highly skilled workers is also increasing across all vertical markets in the SMBs segment."